They say kohlrabi’s flavour is most similar to a broccoli stalk and apparently in Germany it is often eaten raw, with some people biting into it like an apple. I quite like the fresh taste of raw kohlrabi but I was keen to try something new. I found some great ideas for what else to do with it – this Simply Recipes list of ideas includes slaw, curry, puree, rosti and even pickled kohlrabi. The Guardian column on kohlrabi also turned up recommendations to make chips, soup or gratin or thread it on a bbq kebab with halloumi. But after my recent success braising fennel, I had a feeling roasting might bring out something special in kohlrabi too. A hot oven just seems to make any vegetable beautifully tender and sweet. 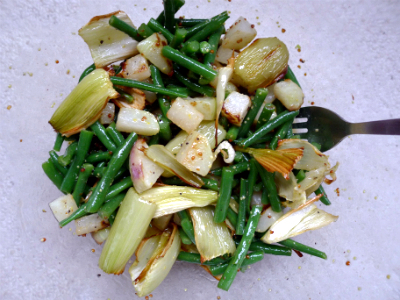 It definitely worked in this salad, with the roasted fennel and kohlrabi taking on a sweet, almost caramelised flavour which contrasts with the vinegar-kick of the vinaigrette-soaked green beans. Yum yum yum. 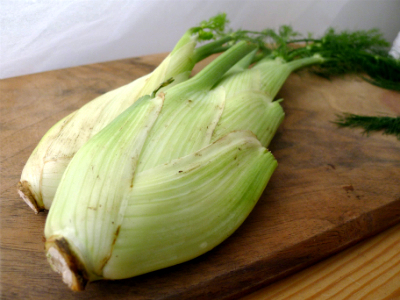 Chop the fennel and kohlrabi and toss in a roasting pan with some oil and seasoning. Roast for 20-30 minutes until softened and starting to crisp on the outside. While the vegetables are roasting, make the dressing by whisking the ingredients together and set aside. Boil or steam the green beans. I boil mine in salted water for 3 minutes, then drain and run under cold water to retain the bright colour. Put them in the dressing while still warm to ensure they absorb the flavours. When the fennel and kohlrabi are ready, remove from the oven and toss with the green beans and dressing. You can also add some salad leaves to bulk it out a bit – but avoid strong flavoured leaves like rocket as they will overpower the delicate kohlrabi taste. Serve warm or at room temperature. 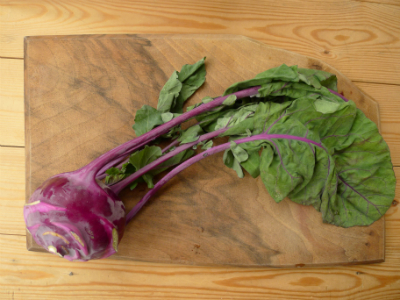 Wow, the kohlrabi is beautiful. I don’t think we have those in Australia, at least not that I’ve seen. Does it lose all of its colour when roasted? I couldn’t see it in the final picture.